International Journal of Research in Health Sciences,2015,3,4,446-450. 1-Professor, 2-PG, 3,4-Assistant Professor, 5-professor, Surgical Oncologist, MNJIO and RCC, Hyderabad, Department of Pathology, MNJIO and RCC , Osmania Medical College, Hyderabad, Telangana, INDIA. Follicular dendritic cell sarcoma (FDCS) is an uncommon tumor arising from follicular dendritic cells that normally form meshwork in lymphoid follicles , this case of ours is a 65yr old female , presented with one month history of cervical swelling along with abdominal discomfort . She has a past history of radical mastectomy for carcinoma breast treated with chemoradiation 12 years back. Endoscopy revealed polypoid lesion in the body of stomach. Both the tumors - Lymph node & Gastric lesion, were excised and submitted to routine histopathological examination. Lymphnode swelling was confirmed as FDCS on immunohistochemistry. 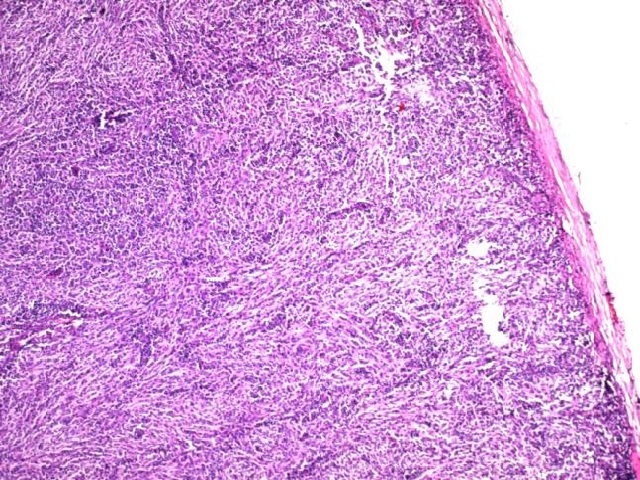 Polypoidal lesion of stomach was confirmed as Benign Gastro intestinal stromal tumor(GIST).Cases of FDCS associated with other malignancies have been described in literature. However to our knowledge, this is the first report in literature, were FDCS is seen simultaneously with GIST – stomach. However further studies are needed for possible relationship between two such neoplasms occurring concurrently.